Want to give your pearly whites a nice, clean shine without going to an expensive dentist? Electric toothbrushes are perfect for cleaning your teeth deeply. You can also polish your teeth using an electric toothbrush to restore whiteness and get a nice, movie star shine. This is possibly the most popular electric toothbrush currently available in the market, and it comes recommended by dentists. This device cleans teeth with a technology called Sonic. Do you know how many brush strokes you give each dental surface when you manually brush your teeth? Probably not. This electric toothbrush can generate up to 31,000 brush strokes per minute. Doing that manually is impossible. The bristles of this electric toothbrush can get into the tight spaces and crannies between your teeth so no food residue is left out once you are done. This toothbrush can remove dental stains caused by things like coffee, tobacco and red wine. This electric toothbrush has five modes: clean, white, polish, gum care and sensitive. The standard clean mode is only two minutes and it’s more than sufficient for daily dental care. You can visibly increase teeth shine and whiteness by brushing for 2 minutes and 30 seconds in the whitening mode. Plus, it charges via USB so you won’t have to bother with annoying wires in your morning routine. This is not just an electric toothbrush; it’s a smart electric toothbrush. This toothbrush has Bluetooth connectivity to connect to your smartphone! You will be able to get real-time information on your brushing habits. This superb toothbrush comes with three brush heads for cleaning and whitening. One brush head is included for sensitive teeth. The bristles on each brush head can angle at 15 degrees. Then, combined with oscillating, rotating and pulsating action, this toothbrush can give you clean and glistening teeth. The brush also has a pressure sensor that lets you know if you are brushing too hard. The brush has 6 power modes to clean the way you like. You can remove twice as much plaque as a manual toothbrush using Black 700. You can clean easily in a matter of minutes. However, dentists recommend cleaning for only 2 minutes per session. You can also use the sensitive brush head to clean your tongue and be rid of bad breath for good. 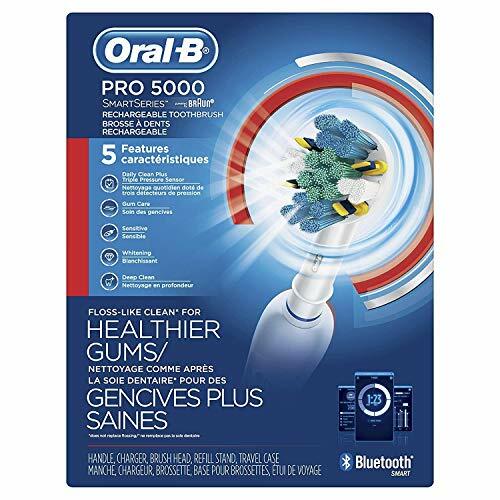 Oral-B Pro 5000 electric toothbrush is similar to Black 7000, but offers several different features. This brush has 5 different brushing modes: daily clean, sensitive, whitening, gum care and deep clean. Daily clean mode is sufficient for everyday needs. The sensitive mode has a gentle speed to avoid causing unpleasant sensations if you have sensitive teeth. Gum care and stimulate gums and remove plaque wedged between the gums and the teeth. The whitening mode can remove yellow stains by polishing the dental enamel. If you want both cleaning and whitening, try the deep clean mode for a thorough cleaning. The brush heads have what’s termed as 3D action, meaning they can rotate and oscillate to clean comprehensively. The brush has branded MicroPulse bristles to clean effectively. Also, it comes with Bluetooth connectivity and a pressure sensor as well. Impressively, the brand offers a variety of replacement brush head when you need to replace the original. However, keep in mind that using this electric toothbrush is not an alternative to dentist recommended flossing. This electric toothbrush was designed by Dr. Patty Martin, an actual dentist, so you know it causes zero to minimal harm to your teeth. Interestingly, the brush heads of this device has UV sanitizer rays to kill most types of microbes and viruses, especially the ones that can cause the common flu. (However, keep in mind that this is not a medical device that will prevent you from catching a cold.) Quite obviously, this brush has been designed with style and practicality in mind. The charge is quite amazing. You can brush up to 6 weeks on a single charge! This electric toothbrush can generate up to 48,000 brush strokes per minute, certainly outperforming most other well-known brands like Phillips. But it only has three modes: normal, soft and massage (to give your gums a treat). The speeds can be quite powerful but are not uncomfortably irritating. The brush has an in-built 2 minute timer to prevent you from over brushing, which can actually damage the enamel. The brush will emit a pulsing vibration every 30 seconds to remind you to move to a different area. You will probably not find a cooler electric toothbrush with similar features. DO YOU HATE GOING TO THE DENTIST? Sonic waves are used by dentists to break up tartar during a scale and polish. You can mimic this yourself and significantly reduce tartar build up by using this sonic technology every day. See description for why SONIC IS BETTER THAN OSCILLATING. GOOD FOR ADULTS AND KIDS - WHY? The vibrations emit a wave which extends beyond the brush's actual contact with the tooth which covers areas beyond what the bristles can actually touch. This provides a more thorough brushing. This is extremely beneficial for kids who are not so thorough in cleaning because the waves reach awkward places near the gum lines and between the teeth. SORE GUMS? Prevent Gum Disease and Tartar. Wave Type Bristles offer a floss action MICROPULSE that gets between the gaps, removes your dental PLAQUE. COMPACT FOR TRAVEL AND HOME. Save space in your bathroom and travel luggage as NO NEED for a cumbersome Charger. DO YOU HAVE BAD BREATH. We have you covered. Control and Eliminate plaque, KILL the BACTERIA and use the back to clean your tongue to leave your mouth and teeth feeling and smelling clean and fresh. Perfect Toothbrush For HOME AND TRAVEL. TRIPLE VALUE: 1. TWO toothbrushes per pack. 2. 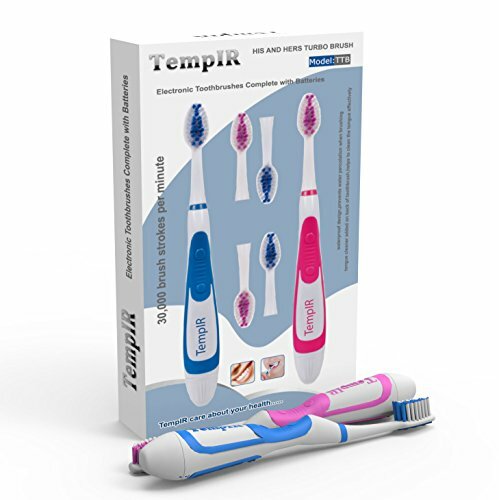 SAVE DENTIST FEES: TempIR proven sonic wave technology* gives you a CUSTOMISED brushing experience and ultra clean teeth. 3. SAVE MONEY: Batteries last for 100's of uses. Four FREE spare brushheads and batteries included. This electric toothbrush has a UV sanitizer to kill 99% of bacteria that can gather on brush heads. 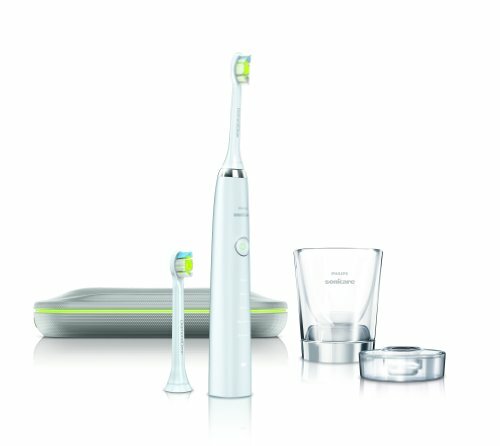 Unlike the other Phillips electric toothbrush mentioned above, this one comes with a wider bristle range and a uniquely angled neck to clean out those hard to reach back teeth. The brush head that are included in the package is said to give the same benefits as flossing. You can restore natural whiteness of your teeth by removing plaque and food stains from the enamel. Overall, you can get a superior deep cleaning effect with this model. The brush comes with an interval timer to prevent over brushing. This electric toothbrush is clinically proven to be effective and safe. If you are buying this product, the bundle package is highly recommended as it comes with a travel charger and travel cases. Conclusion: Electric toothbrushes are far more convenient than manually brushing your teeth. When you shop for one, keep in mind to stick to a dentist recommended brand. All of the above listed brushes are recommended by dentists as safe to use. Also, do not hesitate to spend over a $100 for a good electric toothbrush sold by a reliable brand. For example, brands like Phillips are known to be trustworthy and you can request returns if you don’t like the brush. Avoid cheap knockoffs you find on online bidding sites. Some electric toothbrushes come with more benefits than simply cleaning your teeth. 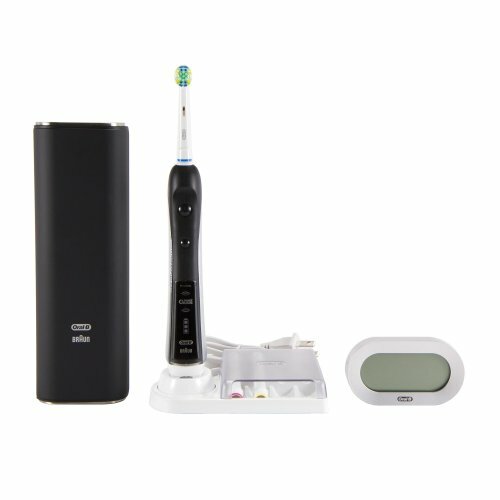 The iBrush SonicWave listed above has Bluetooth connectivity and a corresponding app to keep track of your brushing habits. Such features can be extremely useful for dental hygiene. Products like Philips Sonicare HX6733 has a built-in sanitizer to keep the brush heads clean. It’s worthwhile to make your final purchase decision after considering such features as well.